Another school year flew by for the students of Windham Ashland Jewett Central School. The school gymnasium echoed with songs of pomp and circumstance as the students lined up to receive their diplomas. Full of hope and aspirations, the seniors cheered each other on as they celebrated graduation day, 2018. Education is core to the mission of the Windham Foundation. With that, comes funding for a multitude of educational programs through the school year at WAJ. Most significant to graduating seniors are the scholarships for college and trade school. 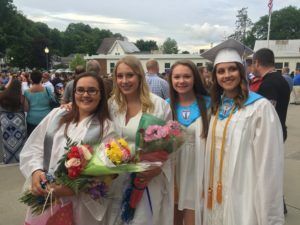 The Windham Foundation has granted $155,000 to graduating seniors since 2004. With that, we are proud to recognize the Windham Foundation Scholarship Recipients for 2018. We wish all of our recipients great success and many rewards in the coming years. Meghan Corrigan is the recipient of Windham Foundation’s Outstanding Student Award. Meghan was selected for this $15,000 award based on her commitment to academic excellence, involvement in the community, and strong extracurricular activities. Meghan embodies the values of teamwork and community. She helped inexperienced team mates learn the ropes and went out of her way to work with them to gain confidence in their skills. Meghan will major in biology at UMass at Amherst this fall. Bethany Kletz is the recipient of our newest scholarship, the Goldman Sachs Gives Outstanding Student Award, a $10,000 grant funded by Goldman Sachs Gives. Bethany is passionate about community service and using her knowledge to educate others. During the summer months, Bethany volunteered for various community initiatives including water clean-up projects both locally and internationally. She gained an understanding of the complexities and challenges facing communities and encouraged others to get involved. During the winter months, Bethany dedicated her time helping students at the Adaptive Sport Foundation. She can be counted on to go above and beyond. Bethany plans to major in elementary education this fall at the University of Vermont. The Windham Foundation’s $2,000 Trade and Technical Scholarship was awarded to Gianna Levine. Gianna’s passion for culinary arts and baking transcended when she entered the BOCES Culinary Arts program in her junior year of high school. As her knowledge and skills grew, Gianna toyed with the possibility of attending the Culinary Institute of America. Determined to make her dream a reality, Gianna exercised her entrepreneurial spirit and launched a catering business. With a goal of growing her business in the future, Gianna will attend the Culinary Institute of America this fall and major in Food Management. The Windham Foundation’s $3,000 BOCES Award for the Trades Scholarship was awarded to Catie Drum. Catie graduated from the BOCES program where she specialized in Cosmetology. Catie’s commitment to her work and her clients drives her to go above and beyond for each and every one of them. Catie will attend The Paul Mitchell Institute for Cosmetology in Staten Island where she will enhance her skills and her ability to build a strong client following.